The first time I encountered this wonderful cake was on a romantic dinner with GI Joe!!! He took me to Dailey’s for dinner before a show at the Fox. The night was what can I say other than just plain great! Sorry to say that Dailey’s closed this year so we can no longer experience their wonderful desserts. But we can treat ourselves to the delicious cake that they served. After that night we took the Athlete there before seeing the Christmas Carol and to this day it is his favorite dessert! So here is a family favorite for many reasons. I hope that you can enjoy as much as we have. 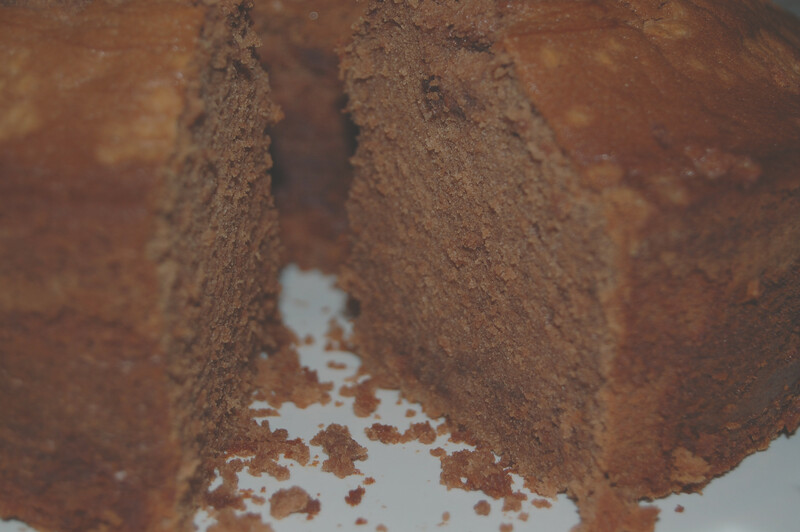 This is not your normal cake where you cream butter and sugar and then add flour alternately with liquid. It is made by the muffin method of mixing. In other words it is just plain easy!!! Pecan pie is GI Joe’s favorite dessert. No that is incorrect! Any dessert is GI Joe’s favorite dessert. Before I could get these little babies cooled good, he had popped two of them in his mouth as we were about to eat dinner. Dessert before dinner can be a good thing! These are cute little pies that would be good to serve at a party. If you are looking for a great recipe for the larger type pecan pie , you should check out Bakerella . She just posted a great recipe. Check it out if that is what you are looking for at www.bakerella.com . It is the December 14 post. Enough about that. 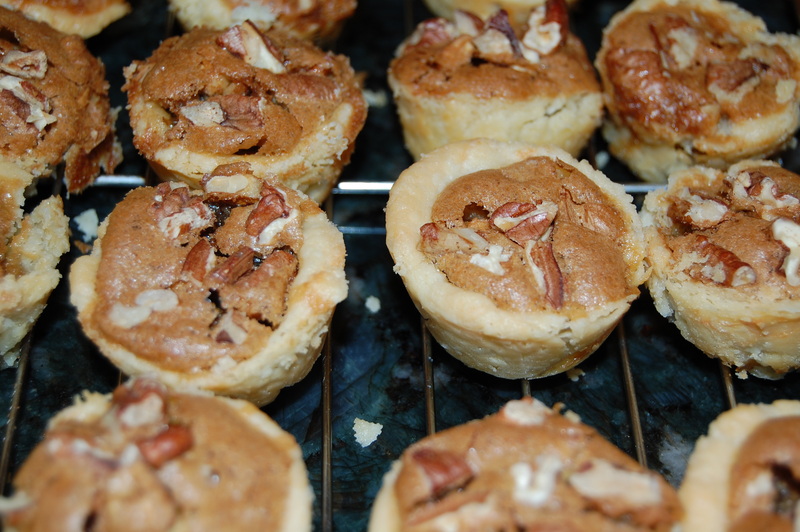 Let’s get started on making these Pecan Tassies. 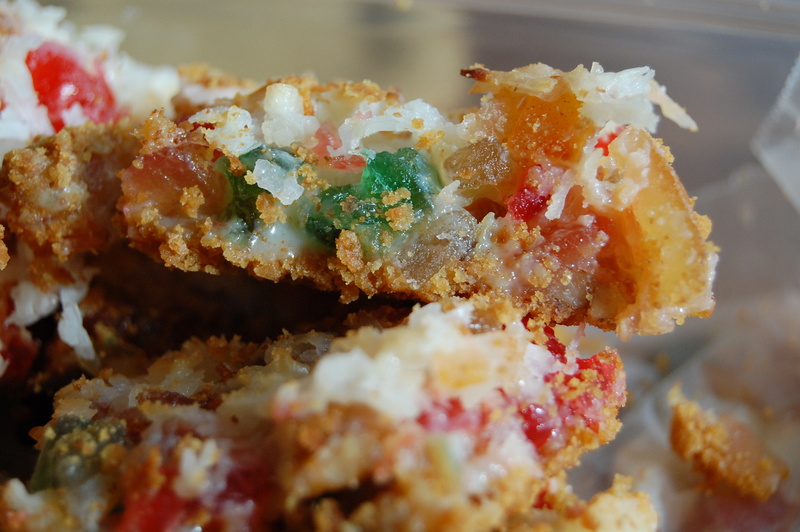 We all have favorites that we love to eat and make during the holidays. This is one of my all time favorites. It is great tasting and very easy to put together. Just what we all need this time of the year. There is one problem. It is very hard just to eat one square!! I made these last night and found myself having a cup of coffee with two of these sweet morsels. Looking at the recipe last night I could not believe how long I had been making them. I got the recipe one Thanksgiving at my Dad’s. My step mother always made them for Christmas. On the back of the recipe I had written sizes of my nephews 2T and size 8 so that I could pick them up a couple of things for Christmas. They are both young men now. One in his last year of residency and the other is running a farm! Time flies!!! This takes 10 minutes to put together! This is one of my favorite comfort foods. Chicken Pie!!! This is quick to make and easy. While it is baking you can do whatever for 45 minutes. You know fold laundry, help with homework, call your mother. To make this even easier I just pulled leftover turkey out of the freezer. I have used a roasted chicken purchased at the grocery or just cooked 2 large chicken breast. Any method is a snap. I paired it here with a salad , but any steamed or roasted vegetables will do. I just don’t think that there is a serving of vegetables in the pie. 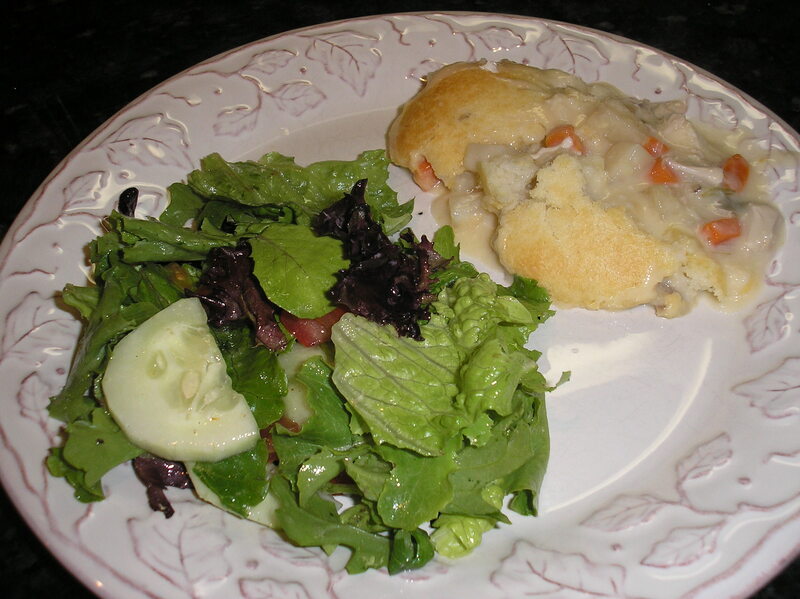 Okay here is the recipe for the easiest Chicken Pie ever! 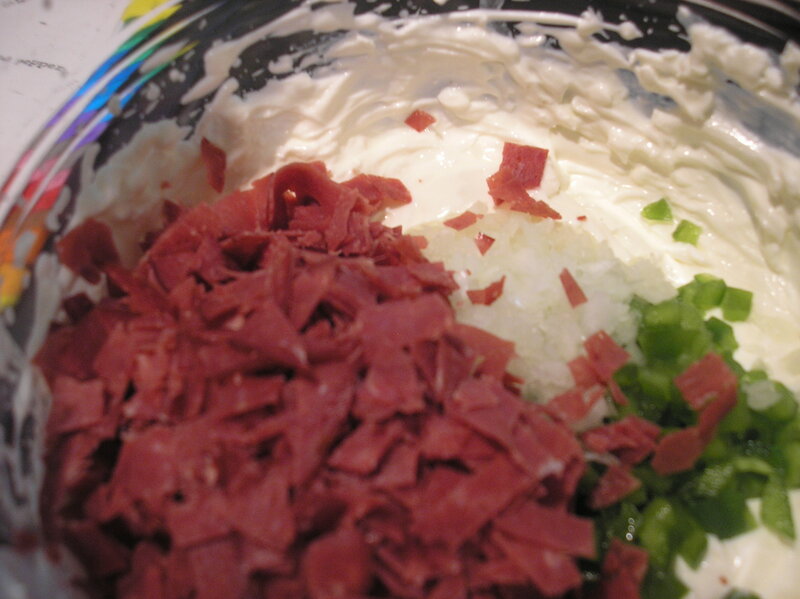 You are going to love this recipe!! I love this recipe for the ease of it. You can make it the night before . Come home from work put it in the oven, make a salad and bread . Set your table and you are ready to entertain guests with no hassle. This is the way to go. I found the recipe in a Pillsbury cookbook years ago and have since noticed that it now appears on the box of Mueller’s Lasagna. The one on the box uses more sauce and more eggs. I have made both and they are delicious!! You are not going to believe that it is made with your favorite brand of premade sauce. That is the beauty of this recipe. 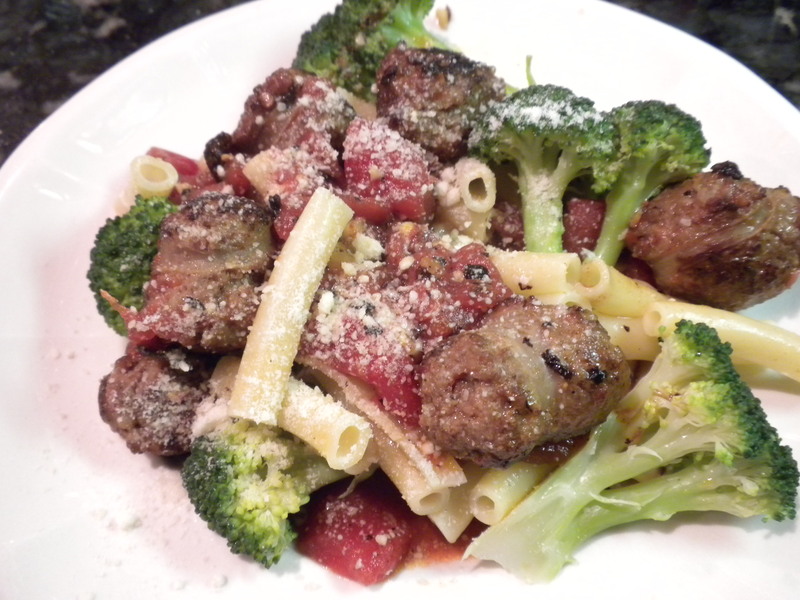 Using Italian sausage gives it the flavor it needs. I use Johnsonville Hot Italian Sausage. I love the flavor. I cannot find it without the casing. I use kitchen shears to remove them before browning. 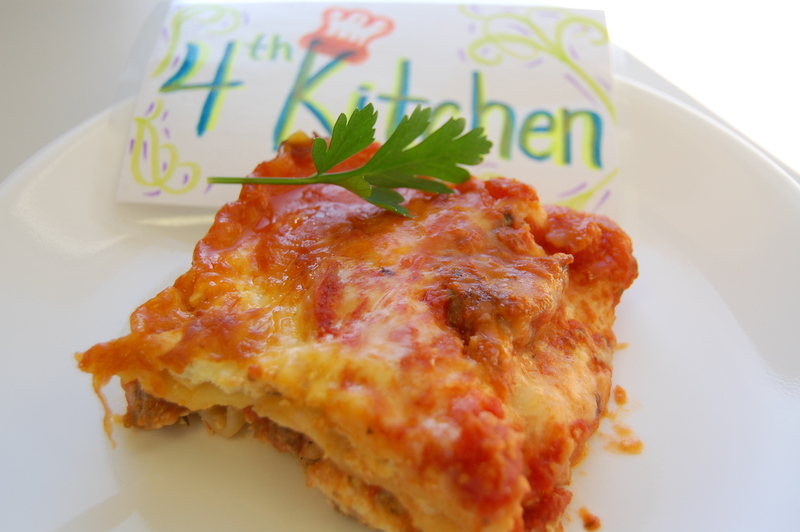 Vote today for the best LASAGNA!! Who will make the top of the post? Yesterday we made Lazy Day Lasagna. Today we cooked and ate it! It was fantastic. We used a new sauce this time and it was the best I have tasted. 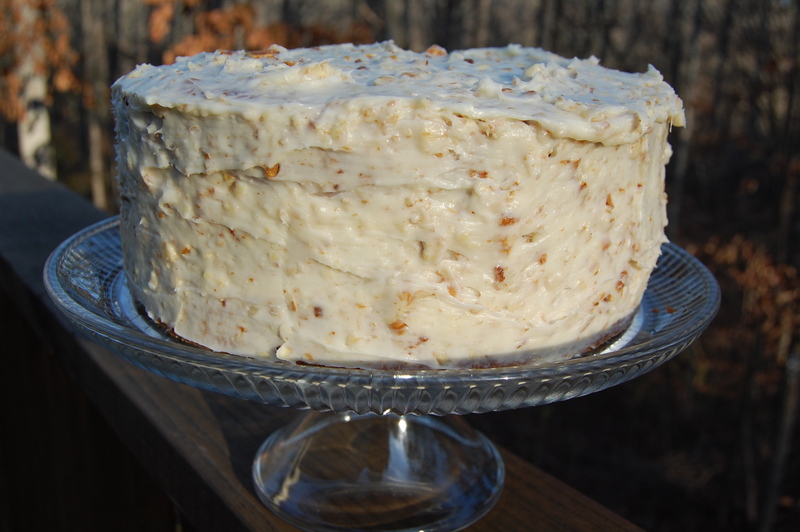 Check out the post tomorrow for the recipe and find out who won. Vote for the Lasagna that has the best presentation. All of them tasted great! Put your comment at the end of the post. If you click on the picture your comment is not seen. Thanks. 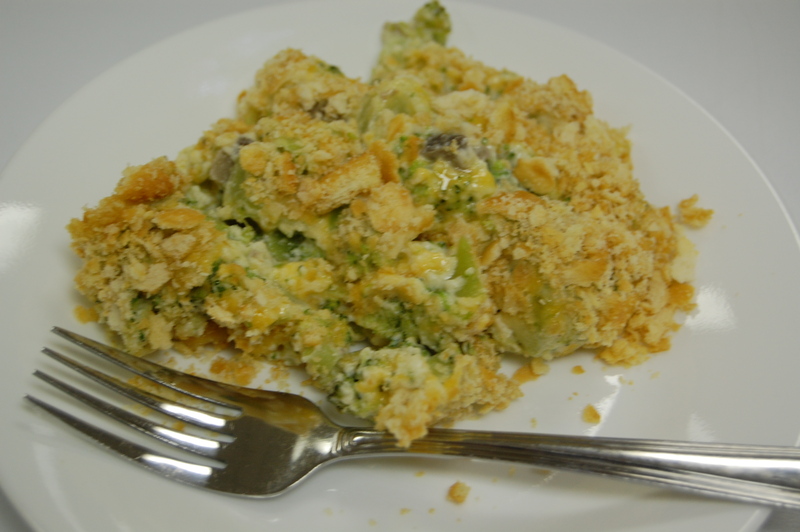 Broccoli Casserole That Your Are Going To Love!! Okay, broccoli is not a favorite of some people. I like it! I like it steamed, roasted, raw! All the previous ways to cook broccoli are very healthy. The Athlete will not eat broccoli any of those ways. I think it is because he ate too much of it as a toddler. He loved it! But now, NO!! So this is his favorite way to eat Broccoli. It is a seasonal dish for our family. We might have this four times a year. But don’t get me wrong it is good.